Kopa Chapaa is a convenient 10 day loan available to Airtel Money customers for low-value cash emergencies in partnership with Faulu Kenya. The loan amounts and its partnership with micro-finance institution indicate that the service is targeted at the low end market. Faulu and Airtel are counting on the credit reference bureau to help profile risky borrowers. Kopa Chapaa is geared to exploit technology to scale up outreach to the unbanked and semi banked by the reducing cost of transactions, improving on convenience and ease of access. For one to qualify for a loan one must be a registered and active Airtel money user for 6 months and performed at-least two transactions. Loan increment eligibility is the repayment behavior of the user. To apply for the loan, customers will dial *305# and follow the menu, which will prompt them to quote the amounts they want and send a message. After that, an SMS will be sent back, telling the applicants whether or not they qualify and how much they will be given as well as when they are required to pay. Apply for Kopa Chapaa loan via the Airtel money menu. 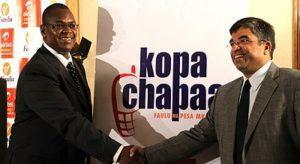 Access the Kopa Chapaa loan by dialing *305*2#. Repay the Kopa Chapaa via Airtel money. The loan repayment mode is via Airtel money. Loan disbursement mode is via Airtel money. The loan default penalty on the 11th day is equivalent to the Kopa Chapaa charge and subsequently thereafter for every set of 10 days in default. Defaulters are blacklisted on the National Credit Reference Bureau whose information is shared between financial institutions in the country. Kopa Chapaa is very advantageous to micro loans borrowers who are Airtel services users as the interest rates are low compared to other options. It can be used on emergency scenarios. On the hand it can quite disadvantageous as it gives very few days as the repayment period. The charges for defaulting are also very high. It is quite recommendable for the active users of Airtel subscribers with a good history and requires urgent cash. For those that require more money there are other options that are available for them.